Fourteenth Isha Gramotsavam – The Largest Sporting Arena of Rural Tamil Nadu! 4000 villages - 40,000 players - INR 62 lakhs in prizes. 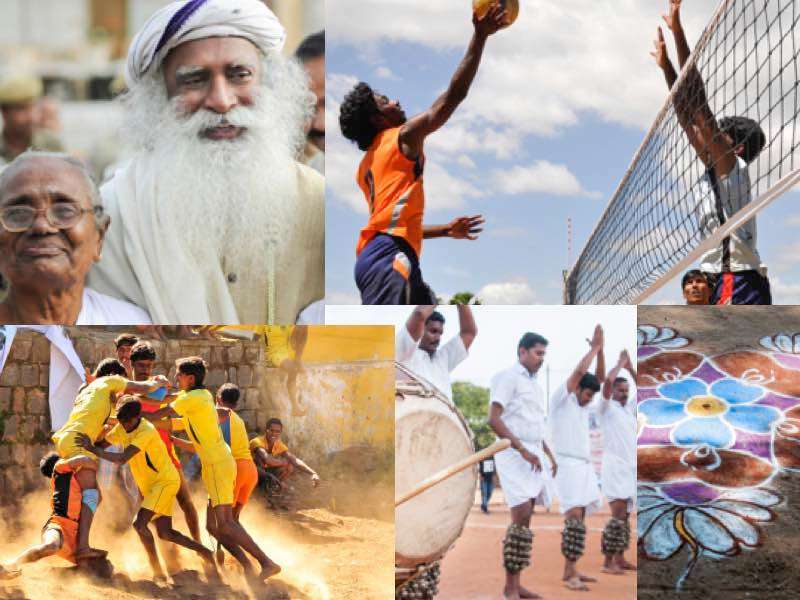 The fourteenth Isha Gramotsavam is poised to be the largest sporting arena for Tamil Nadu Villages! Isha Gramotsavam is a celebration of village life showcasing the essence of rural Tamil Nadu through an elaborate display of rural games, art, drama, dance, music and food specialties. The event highlights the role of sports in rural life by featuring the final rounds of a state-wide inter-village sports tournament. The festival is part of Action for Rural Rejuvenation (ARR), a rural revitalization program under the aegis of Isha Foundation. ARR provides a comprehensive approach to improved health, livelihood and community revitalization, and to date has reached over 4600 villages and forty-two lakh people. Every year, Isha reaches thousands of players from hundreds of villages. But this year, with a massive effort towards scaling up so that as many people can benefit from this wonderful opportunity to transform their lives, 4000 villages encompassing 40,000 players have participated! This scale has never been achieved before, making the 14th Isha Gramotsavam the largest sporting arena of Tamil Nadu villages! Not only that, in addition to men’s volleyball and women’s throwball tournaments, this year an age-old game played in Tamil Nadu, kabaddi, has also been introduced. And to make it extra special and interesting, the Tamil Nadu pro-kabaddi team – Tamil Thalaivas – have offered to play a friendly match with the winning kabaddi team. Indeed, a huge incentive in itself and a great honor for the amateur team that will win in Gramotsavam. Isha Gramotsavam, which is a part of the larger effort Action for Rural Rejuvenation (ARR), aims to bring back the enthusiasm and celebratory spirit of rural India through sports, but also showcases folk dance, art, drama and a traditional food festival. Volleyball for men and throwball for women are held as the main tournaments. Besides, there are also kabaddi, Paralympics, rural sports competitions and art events. This year, the 14th Isha Gramotsavam Tournaments began on October 20 in Tamil Nadu. The matches are played on divisional, regional and state levels, with the finals matches to be held on December 9 in Texvalley, Erode. Overall, 4,000 rural teams have participated from all over Tamil Nadu comprising of more than 40,000 players, both men and women. The state-level final matches will be held in the presence of Sadhguru, internationally-accomplished sports celebrities and key personalities who attend the event as special guests. Former Tamil Nadu Chief Minister K Karunanidhi, cricket legend Sachin Tendulkar, India's first female IPS officer Dr. Kiran Bedi, and Sports Minister Rajyavardhan Rathore have participated in the previous years. The Honorable Governor of Tamil Nadu, Shri Banwarilal Purohit, is the special guest at the Isha Gramotsavam festival in Erode (Texvalley) on December 9. Moreover, tens of thousands of people from across Tamil Nadu will also come to Erode to watch the rural sports games. The Ministry of Sports recently awarded the “Rashtriya Khel Protsahan Puraskar” award to Isha Outreach, recognizing the work done to promote sports in the villages of Tamil Nadu. Furthermore, the Government of India has recognized Isha Outreach and it is now the first NGO in Tamil Nadu to have been accredited under the “Khelo India” scheme.